I don’t fish for any kind of recognition or have a blog to boost my ego, it is simply the enjoyment I get from fishing and sharing the stories. That being said, it is fun to see something you have accomplished be accepted by someone else and deemed worthy enough to share with a wider audience. This page, chronicles a sampling of when that has happened. 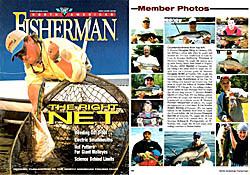 An article about this website and the mission I have of promoting multi species fishing. It was with a lot of mixed emotions when I moved from Huron to North Ridgeville in 2014. Huron is a great community and one I will return to often. The people from the Chamber were as quality as you could ever meet. I had caught a giant Silver Redhorse that happened to catch the eye of Andrew Ragas from FHQ and Ragas Media. 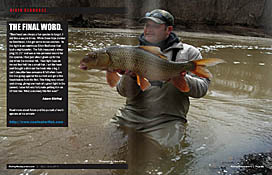 His online magazine happened to do an article on redhorse fishing and used my photo. The owner of Cold Creek Trout Camp happened to come by as I was bringing to the net a fine male Brown Trout. 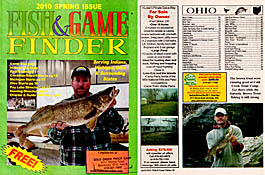 He snapped a photo and gave a copy to Fish & Game Finder, who subsequently used it in their magazine on the Ohio introduction page. 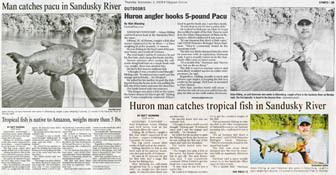 The story of the Pacu I caught in the Sandusky River made it’s way into numerous newspapers and websites. Please go to the page “Ohio Pacu” to read the story of an amazing catch. I had no idea when I submitted a photo to Mepps as part of their Master Angler Program, it would end up being selected for the front cover of their annual fishing guide. The honor also came with a very nice personal letter and a nice supply of Mepps gear and lures. This is likely my best or most widespread fishing ‘accomplishment’. I had a real nice photo of a 29.5″ Walleye that I thought was worthy of submission to NAFM. It was published in the “Member’s Photos” section. 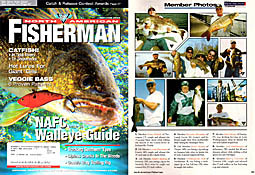 The photo was taken by Walleye professional angler, Nate Provost. I caught a rather massive Largemouth Buffalo and decided to submit the photo to NAFM. It was published in the “Member’s Photos” section. This remains one of, if not the largest fish, I have caught in freshwater. 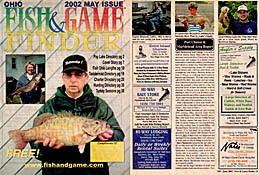 I gave a copy of the same Bluegill photo from below to Rob at Riverfront Marina, he ended up giving it to this publication. At the time, this magazine only had a couple pages in color. I was impressed that my photo made it onto one of those pages. It was a beautiful fish. 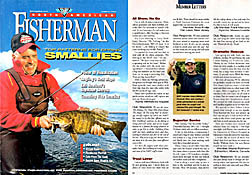 I had caught a huge Bluegill in a friend’s pond and sent a photo to the magazine. While I thought it might make the “Member’s Photos” section, it ended up actually getting a small ‘featurette’ on one of the pages.